Zak and I decided to venture over to the West Side Market after a lovely lunch at Nate’s Deli to pick up some fresh fish and perhaps a vegetable or two. After strolling around and checking out the options, we settled on a whole branzini, also known as bronzini, European sea bass, or Mediterranean sea bass, at Kate’s Fish. I am always so happy to have taken a trip to the West Side Market, because we always return with a gem and have a great time shopping. I love whole fish, first because it’s incredibly easy. I was very intimidated the first time I bought one to cook, but now it’s my go-to choice for when I’m feeling a tad lazy but want guaranteed results. I make sure the fishmonger has it scaled and gutted, perhaps with the fins cut off. You basically need to follow a simple formula of rubbing with oil, seasoning, stuffing with aromatics, and then grilling, roasting, or steaming. Another advantage is the serious price reduction versus a steak or fillet. Finally, the flavor is excellent. As any cook worth their salt should be well aware, bones, cartilage, and skin are more or less synonymous with flavor and moisture. Unlike a standard fish fillet or steak, a whole fish has all three. 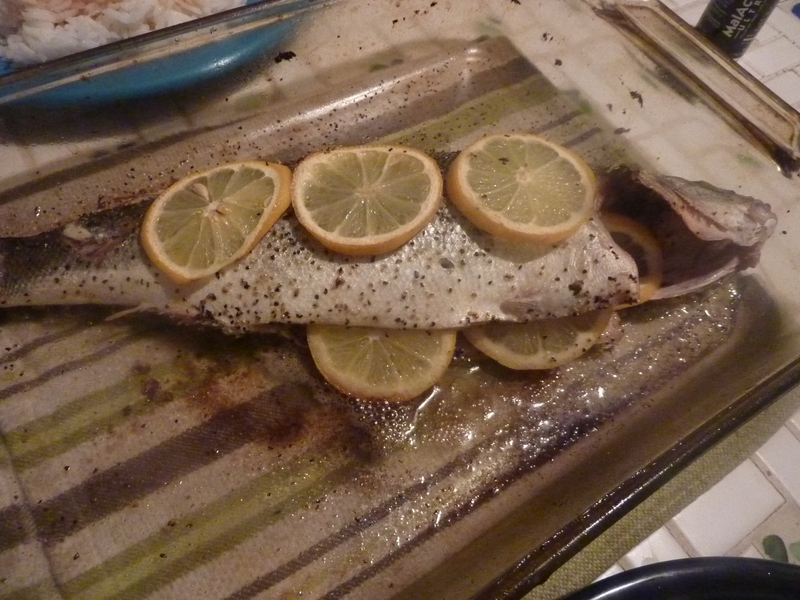 I prepared this lovely whole bronzini as simply as possible. Olive oil, salt, pepper, and lemons go perfectly with fish. The simple seasoning and high-heat roasting resulted in a moist and succulent fish that allowed the flavors of the bronzini to shine through. I served this with some asparagus similarly prepared with a quick toss in olive oil, salt, and pepper and roasted in the oven. Make sure fish is gutted and scaled. Cut off all fins except the tail fin. Rub liberally, inside and out, with olive oil. Season both sides and the body cavity with salt and pepper. Stuff most of the lemon slices in the body cavity and lay a few on top of the fish. Transfer the fish to a glass casserole dish in which it can lay flat. Transfer to the oven and roast 25-35 minutes, until flesh flakes easily with a fork and reaches the internal temperature of 145º. Serve immediately with extra lemon wedges for serving. Today, Zak and I took a trip down to Cleveland’s wonderful West Side Market to pick up some produce and a few flesh-based treats for the week. The West Side Market, located on W. 25th Street, is one of the cooler things about living in Cleveland. I’m actually ashamed that we don’t go there more often, and after our trip today, I resolved to do a lot more of our shopping there. All of the products sold there are fresh and the prices are incredibly reasonable. The atmosphere is fun and exciting – it’s usually packed with people (although I’ve never had a problem with lines, since the staffers of the booths are fast, friendly, and efficient) and there is often live music playing. I could spend the entire day just wandering around eye-balling the amazing meat and produce, inventing millions of different menus in my head. If you live in the area, I highly recommend you check it out – it’s even worth a drive for a day trip, in my opinion, especially because W. 25th has lots of great restaurants and shops to visit as well. Although salmon isn’t my favorite fish, we’ve been making an effort to eat healthier and there is no doubt that salmon is one of the healthiest fish (and foods) around. Plus, the salmon fillets that are the main component of this dish looked so fresh and beautiful they were hard to resist. This dish was absolutely delicious – even from my non-salmon-loving perspective. It’s hard to mess up really great ingredients, and both the salmon and leeks were absolutely gorgeous. The flavors were fresh and everything really complimented each other. Season both sides of salmon with dried dill weed, kosher salt, and freshly cracked black pepper. Let sit out 30 minutes to come to a cool room temperature. Heat olive oil in a large non-stick skillet over medium-high heat. Add salmon to skillet, skin side up. Cook until golden-brown, about three minutes. Flip and cook another 2-3 minutes until cooked through or to desired consistency. 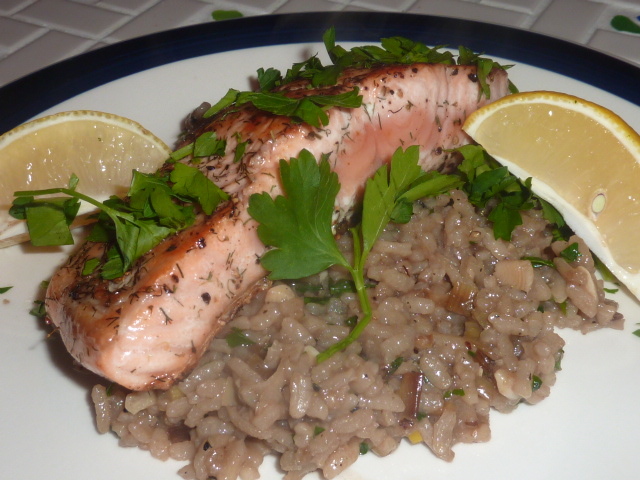 Serve over risotto and garnish with flat leaf parsley and quartered lemon. Cut off dark green park of leek and save for another purpose. Cut remaining white/light green portion of leek in half lengthwise and then thinly slice into half moons. Heat 2 tbs. olive oil in a 10″ cast iron skillet over medium heat. Add leeks and season with kosher salt and freshly cracked black pepper. Reduce heat to low and caramelize leeks 20-30 minutes, stirring occasionally. Meanwhile, in a small saucepan heat seafood stock over medium heat until at a low simmer. Cover and reduce heat to maintain at a simmer. Add garlic and sauté until fragrant, 1-2 minutes. If necessary, add remaining tbs. of olive oil and raise heat to medium. Add rice to oil and toast it for 3-5 minutes until lightly golden brown. Deglaze pan with clam juice, allowing liquid to bubble away completely. Slowly, one cup at a time, add the simmering stock. Stir frequently. As each cup of stock is completely or nearly completely absorbed, add another cup of stock, continuing to stir. Cook, slowly adding stock and frequently stirring, until rice is al dente or to taste. This will take roughly 25-35 minutes, but may take longer. Once final cup of stock is almost absorbed, add Brummel & Brown and flat leaf parsley and stir to combine. Zak and I like a little bit of a crunch to our risotto from time to time, so I let all the liquid bubble away on the bottom and the rice to crisp up, then folded the crispy bottom into the rest of the risotto.